Fascism has presented itself as the anti-party; has opened its gates to all applicants; has with its promise of impunity enabled a formless multitude to cover over the savage outpouring of passions, hatreds and desires with a varnish of vague and nebulous political ideals. The Working class spontaneously gravitates towards socialism; nevertheless most widespread (and continuously and diversely revived) bourgeois ideology spontaneously imposes itself upon the working class to a still greater degree. “It’s not just about 20 cents”. 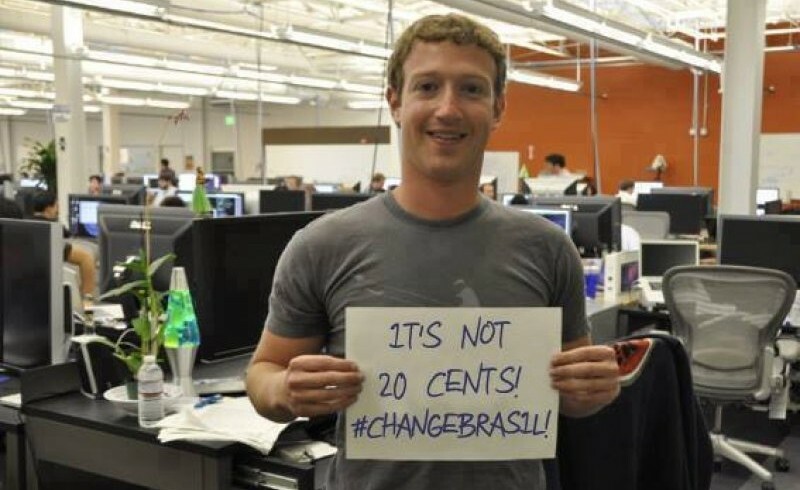 This was the status message of Mark Zuckerberg, head of Facebook last week, a message that was relayed through several of Brazil’s major cities. The message became one of the initial slogans of what many are now calling the “Vinegar Revolution” which was reportedly triggered by a 20 cent hike in bus fares in the city of Sao Paulo June 20th. The very mention of Zuckerberg in connection with mass protests should immediately sound alarm bells among those who have been following closely the Facebook, Twitter fomented ‘colour revolutions’ that have rocked several states targeted for covert regime change by US imperialism over the last decade. Colour revolutions are essentially fake revolutions orchestrated by NGOS funded by the US government which are organized in countries ruled by governments that threaten or present an obstacle to the furtherance of US interests. Zuckerberg is a close associate of US president Barack Obama and it is open knowledge since the recent NSA scandals that Facebook is a key part of the US intelligence community. His endorsement of the protests should therefore lead one to question the real origins and motives behind some of the largest demonstrations Brazil has seen in over 20 years. Former Governor of California Arnold Schwartznegger, pop stars Beyonce, Lady Gaga and Britney Spears and the crème de la crème of Brazil’s soap opera stars, were all photographed displaying slogans supporting the Brazilian protests. “It’s not just about 20 cents. It’s about much more”, say the protestors; corruption, rising cost of living, bad public infrastructure, health care and education. These are left wing causes, and are the issues driving discontent in Brazil’s populous cities teeming with poverty and inequality. No one can deny the genuine character of such complaints. After all, Brazil is a capitalist society in the ‘developing’ world. Since the rise to power of President Lula de Silva and the Partido Travhalleros (Workers Party) in 2002 Brazil’s economy has experienced a rapid period of growth. It is now set to overtake France and Germany making it the fifth biggest economy in the world. But Lula’s left-wing political orientation was matched to a very large extent by economic policies which opened up the country to further levels of exploitation by foreign multi-nationals. In fact, Lula was so nice to foreign multinationals that he managed to avoid demonization by the Western power elite and was promoted as a suitable alternative to the more radically left-wing policies of Venezuela’s Hugo Chavez. However, in spite of Lula’s cooperation with the IMF, the Brazilian economy remained under national control to a significant extent but the process of destabilization currently underway is part of Wall Street’s final push for hegemony in a country that has moved closer to Russia and China and whose fiscal policies have pulled it away from Wall Street and its ‘free trade’ agenda. It should not come as a surprise that hundreds of thousands of citizens would protest the obscene inequalities in a country that is investing millions constructing lavish sports complexes for the World Cup and the Olympic Games while millions continue to live in Favelas. Yet the uprising, in spite of its demands for public services, was anything but left-wing in orientation. In fact, many of those leading the protests attacked communists and socialists, chanting slogans against Cuba and Venezuela. Brazil’s right wing opposition parties and media came out in support of the protests. Globo Rede, the right wing media group that dominates Brazil’s media, initially believed the protests were left wing and denounced them as terrorism. Then it seemed to realize that the protests were of an entirely different orientation, that they were an attack on the PT government and on left-wing ideology in particular, and proceeded to back and encourage them. So, the question we are posing here is this: are the protests against neo-liberal capitalism or are the obvious evils of capitalism being covertly harnessed by outside forces to shift the geopolitics of a country moving closer to an alliance with Russia, China and left-leaning Latin American governments, thereby contributing to the possible formation of a new anti-imperialist block of emerging economies? The struggle between the national and the comprador bourgeoisie. Lenin, in his book Imperialism the Highest Stage of Capitalism, quotes from a German author who observes that South America “is so dependent financially on London that it ought to be as almost a British commercial colony”. Anglo-American financial interests dominated Brazil until the 1930 revolution brought Getullio Vargas to power. Vargas, a controversial character, who went from liberal left to far right and back again, is generally credited with having nationalized key sectors of the economy in order to industrialize and modernize Brazil. Vargas drew extensive support from the petite-bourgeoisie but was opposed by the conservative landowning class centred in Sao Paulo, who rose up in rebellion against him in 1932. Since the 1930s politics in Brazil has been characterized by a struggle between the comprador bourgeoisie, who favour free trade and financial speculation, a class whose interests coincide with foreign companies and centres of financial power such as Wall Street and the City of London, and the rising national bourgeoisie, whose interests require protective tariffs on imports, investment in infrastructure, and a strong interventionist state to regulate and promote domestic industry. This conflict has often been played out within successive Brazilian governments between the Bank of Brazil linked to the former and the Ministry of Finance linked to the latter. The comprador bourgeoisie in Brazil have always implemented domestic polices in accordance with US interests while the national bourgeoisie have tended to favour a more independent domestic and foreign policy. Similarly, the recent events in Brazil should be seen as an attempt by the comprador bourgeoisie comprised of speculators and vulture capitalists working for Wall Street interests, who, through NGOS financed by the latter, have mobilized the lower-middle class or petite-bourgeoisie against the institutions that constitute the power base of the national bourgeoisie, that is to say the legislative and the executive organs of the nation-state. They are doing this on the one hand through manipulation of the judiciary and on the other, through manipulation of the desires and egos of the new, lower middle class or petite bourgeoisie, who have been brought up on a diet of consumerism, video games and pop culture. The point of all this is to use the lower middle class protestors as a battering ram to destroy the state institutions thereby bringing the country fully under the control of Washington. There is also another pole of destablisation at work in Brazil; this involves manipulation of the indigenous communities and environmentalism by corporate-financier interests. The purpose of this manipulation is to wrest control of natural resources from the Brazilian Federal state and bring them under the control of international corporate entities such as the World Wildlife Fund. When President Rousseff suggested calling a plebiscite to find out what the protestors wanted changed, the proposal was highly criticized by opposition members who support the protests. She has proposed reforms which would greatly improve the democratic process in Brazil, yet most of the street oppositionists have rejected them because they “see politicians as being part of the problem, not the solution, and have been critical of both the president’s and Congress’ efforts”. This is because the protestors do not have a conscious, coherent, political programme. The purpose of this imperialist destabilization is to break the ‘patrimonialismo estatale’; that is to say, Brazil’s traditional dirigistegovernmental structures that hamper unbridled penetration by foreign investors, thereby weakening the sovereignty of the Brazilian federal state. This would then prepare the terrain for a right wing seizure of power by the military that would re-orient Brazil’s domestic and foreign policy toward that of the United States, thereby putting an end to the BRICS multi-polar axis in favour of the unipolar, Anglo-American dominated New World Order. In order to understand the mechanism’s of US power currently at work in Brazil, we need to revisit the 1964 military coup. The Central Intelligence Agency organized a military coup against the government of former President Vargas’ protégé, Joao Goulart, in 1964. Like Lula and the Workers Party, Goulart was an anti-communist liberal who sought to implement modest social and labour reforms, the ‘reformas de base’ were intended to modernize the country. Goulart’s reforms had support among the working class and the national bourgeoisie and included a mass literacy campaign, land reform enabling the government to take over estates of over 600 hectares deemed unproductive, and electoral reform extending the voting rights to illiterates. Like the current Brazilian administration, Goulart had also pursued a more independent foreign policy from Washington. He relaxed persecution of communists. This upset Washington. Goulart favoured nationalist military officers over those trained by the United States and began purchasing military hardware from Eastern Block countries such as Poland. Laws limiting the amount of profits multinationals could take out of the country were also enacted by the Goulart administration. This state intervention in the ‘free market’ upset the directors of multinational corporations, who immediately began dreaming of a ‘transition government’. Goulart had been the vice president of Janio de Silva Quadros, who was overthrown in 1961, by a US-backed coup after he refused to support President Kennedy’s plans for the invasion of Cuba. However, the US-backed coup against Quadros failed to prevent the election of Goulart in 1964. Goulart was no friend of left-wing causes. He supported Washington during the Cuban Missile Crisis. He simply pursued normal diplomatic politics with countries the US wanted to destroy and implemented reforms needed to industrialize the country. This was anathema to Washington who considered Brazil to be a colony of the United States and therefore subject to direct orders from above in matters of foreign and domestic policy. The Central Intelligence Agency went to work. The American Federation of Labor and Congress of Industrial Organizations and the Agency for International Development were used as front organizations for the CIA. Mass demonstrations were organized by CIA agents throughout the country. Over a million people took to the streets calling for a national revolution. Anti-communist hysteria was whipped up by the Catholic Church in conjunction with the CIA. Irish Catholic priest Fr. Patrick Peyton, a CIA asset, helped organize the famous Marcha de Familia Com Deus Pela Liberdade – The Family March with God for Liberty. Funding for the covert ‘people power’ coup came from over three hundred multinational corporations. In order to create the impression that the ‘revolution’ was ‘popular’ and had support among diverse sectors of the population, the CIA helped set up numerous ‘civil society’ organizations. The feminists were represented by the Campanha de Mulher Pela Democracia, the Women’s Campaign for Democracy, which branched out into myriad groupings throughout the country such as the League of Women for Democracy in Belo Horizonte, the Gaucha Democratic Action in Rio Grande do Sul, the Ceará Civic Movement in Ceara; the Civic Union of Women in São Paulo and the Women’s Crusade in Pernambuco. These organizations worked in the favelas in order to manipulate working class communities into joining the protests on behalf of the ruling class. As part of its ‘revolutionary’ strategy of regime change, in 1961 US government helped set up the Instituto Pesquisas e Estudos Sociais, The Institute for Research and Social Studies, in Rio De Janeiro. The institute worked to collect data on social trends and behaviour among the Brazilian population, in order to create effective anti-communist and anti-populist propaganda through advertising campaigns, cinema and the mass media. Many lectures by the institute were aimed at housewives who were warned of the dangers that communism posed to family values. The institute also targeted students with influential documentaries such as “Deixem o estudante estudar” – Let the students study. There is an important book in Portuguese by journalist Denisse Assis entitled Propaganda e Cinema A Serviço do Golpe which studies the use of predictive programming by the Brazilian Cinema and mass media in the run-up to the 1964 coup. An indication of the importance that the US ascribed to its operation was that the Air Force officer tasked with arranging some of the logistics was Paul Tibbits, who flew the plane that dropped the atomic bomb on Hiroshima. The change in government will create a greatly improved climate for foreign investments. Operation Brother Sam was marketed as a “revolution” by the mainstream press and it resulted in what William Blum has described as one the worst fascist dictatorships of the twentieth century. The emphasis on lack of “morality” in a left wing government is, as we shall see, precisely the character of the recent protests throughout Brazil. The whole Brazilian system, the whole Brazilian government is for the benefit of multinational corporations. It’s a heaven for multinationals: the government has created a system of tax incentives which is phenomenal. Corporations also do not have the same kinds of safety requirements in Brazil as at home. A study was conducted on Ford and Volkswagen and it was found that they had turned off the safety equipment on the assembly lines, particularly on the lathe operations, which has had the result that Brazil has one of the highest industrial accident rates in the world. Fingers get chopped off. Lula (Brazil’s most prominent labor leader) doesn’t have one of his fingers; that’s typical of lathe operators. Workers have gone on strikes just to get protective masks and gloves, just for safety – it’s absolutely essential safety equipment which people have to strike for, and since strikes are illegal, they face imprisonment and trial, just to be able to have safety equipment. Fiat came into Brazil around 1975 or thereabouts, and located in two areas, Rio and Minas Gerais. In Rio, Fiat purchased an existing Brazilian-owned factory, Fabrica Nacional de Motores, which employed 6,000 workers and has always done very well. Fiat had a subsidized loan from the Brazilian government for purchasing the plant. The loan was money obtained by the Brazilian government outside of Brazil – thus increasing the foreign debt – and lent to Fiat at a subsidized interest rate, and all to purchase a Brazilian company that already existed in Brazil. It was a ridiculous deal. The first thing, Fiat did was fire 3,000 workers and auto-, mate the plant. Then Fiat also opened a new plant in Minas Gerais. The deal there was that they would get 10 years of no taxes whatsoever, plus subsidized loans for a number of years. After all that, they have recently closed the plant; they decided that they weren’t getting enough loans and enough benefits from the Minas Gerais government. The role of Fiat, General Motors and other giant manufacturing corporations in the current events will be investigated anon. During the fascist dictatorship, progressive labour laws initiated in 1943 under Consolidação das Leis do Trabalho (CLT), the Consolidated Labour Code were abolished. The CLT had made it difficult for employers to fire workers. During the dictatorship new laws were passed making it much easier for employers to dismiss workers without just cause. Under the Wage Adjustment Law of 1965, the military regime determined the minimum wage of workers. The 1988 Brazilian Constitution greatly improved collective bargaining rights of workers; the maximum working hours of workers was reduced from 48 to 44; minimum payment for extra time increased from 20% to 50% of the workers’ wages, working shifts were reduced from 8 to 6 hours per day, a holiday bonus consisting of one third of the workers wages was introduced and firing costs for employers were raised by 30%. A report written in conjunction with the World Bank in 2000 entitled “Brazil: The Pressure Points in Labour Legislation”, advocates a return to the labour laws of the fascist regime, citing the ‘pro-Labour bias’ in Brazil’s constitution and labour laws as a serious cause of the ‘Custo Brazil’, the ‘abnormally high costs of doing business in Brazil’. Gerassi, John, The Great Fear in Latin America, p. 81.